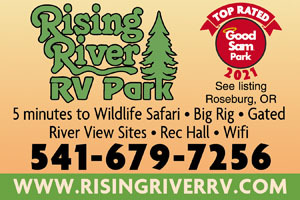 Rising River is a friendly, family run park on the bank above the Umpqua River. Fishing, Floating, Lots of Green Space, Fenced Dog Run, New Sites. Explore area attractions, gather in our rec hall or just relax in our park. This is a nice place and bathrooms are super but the payment for days is not good. Watch out for these guys they will tell you that a week is $215 for 7 nights but they will charge that price and give you 6 n9ights and if you say anything then they will tell you they will charge you at day rates which are so much higher and they make you move in the middle of your stay. Ithink this is not good practice U think u should be told up front. 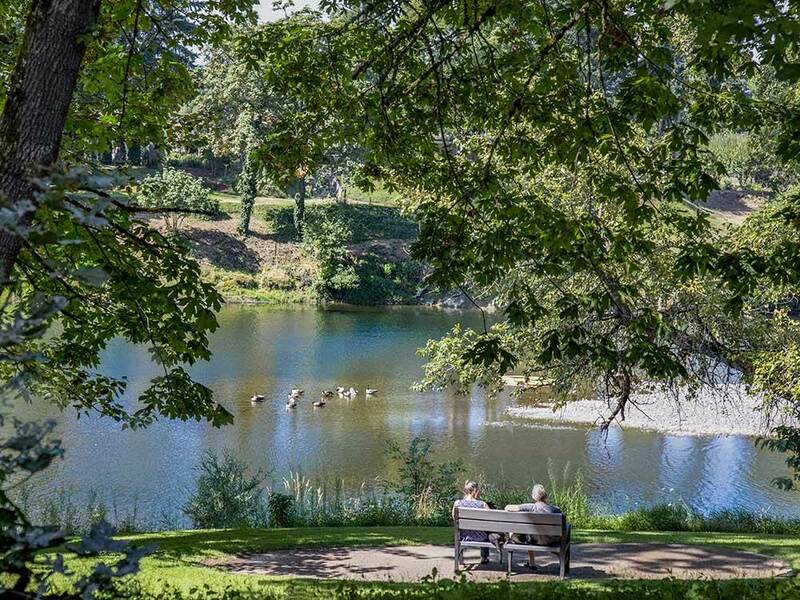 Nice park right on the shores of the Umpqua river. New owners took over 2 years ago and they are slowly making changes to improve the park. We had a site right along the river. This seems to be where most of the short term spots are,. The park has a high percentage of permanent residents. They seem to be grouped into the middle section leaving the best spots for short term. Spots are level gravel pads with hookups on both sides. The showers were all individual and well cleaned and cared for. The location is just 2 miles from the Wild Animal Safari and several wineries. We were happy staying here and would do it again.. Thank you for staying with us and we are glad that you enjoyed your stay. We enjoyed our stay at Rising River RV Park felt like we were at home. We stayed a couple nights which spoiled us we were on a river view site Love it. The park staff was great very helpful. We were helped with parking our trailer upon arrival and any questions we may of had were answered. Had all kinds of birds in the trees to enjoy along with a few squirrels and the ducks and geese on the river couldn't ask for anything better. The grounds were very nice and well kept. The restrooms and showers were always taken care of and very clean no issues at all in the park and facilities. The Rising River RV Park is very secure as there is a code to enter the gate after hours also to enter restrooms and showers. Checked out the laundry facilities and rec area plenty of washers and driers have a commons room with tables for gatherings a pool table and games and movies. Thus us a place we would enjoy visiting again for sure. Thank you for stayiing with us and we are glad you enjoyed your stay. Best RV resort we have stayed at. Very clean, very accommodating, very quiet. The office staff are always friendly and glad to see us. They treat yu like family and make sure you have everything to make your stay a great one. We normally stay every couple of months for the past year but health has prevented more frequent trips. Rising River RV resort was a very nice place to stay at for a night. It was just a couple miles off the I 5 Hwy a few hours north of California and into Oregon. Oregon is very green with beautiful mountains, rivers and forests was quiet and clean and the management staff were very friendly and helpful. I would stay here again. From Jct of I-5 & US-99 (exit 119): Go SW 2 mi on OR 99/OR42 to Andorra Dr, then go 1 Block SE on Andorra Dr to Grange Rd, then SW 1/8 mi to park (straight ahead). Do not continue uphill on Andorra, turn right on Grange.